Global Communications Agenda 2015 shaped by 34 countries! 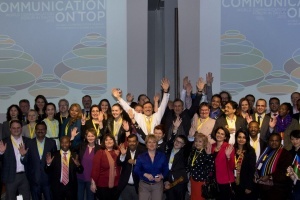 On March 10-11, the sixth edition of the World Forum "Communication on Top" traditionally welcomed delegates from 5 continents at the Davos Congress Centre in Switzerland. Leading representatives from 34 countries shaped the Global Communications Agenda 2015. Official partners of the summit were the Russian Venture Company (RVC), MOL Group (Hungary), the Institute for Science & Innovation Communication - INSCICO (Germany) and the association for city branding "IZHEVSK - a smart city with a soul" (Russia). #WCFDavos expanded considerably, accepting in the family remarkable experts from 11 new countries: Armenia, Azerbaijan, China, Djibouti, Gambia, Egypt, Jordan, Liechtenstein, Morocco, Norway, Slovakia and South Africa. The largest delegation was from India, with almost 20 participants, 5 of which - students in communications. The list of communications industries of countries represented so far in the global #WCFDavos community already counts 55! The #WCFDavos content in 2015 focused on priorities and challenges of the global communication agenda, government communications, public diplomacy, communications and leadership, cross-cultural and global communications, and innovative education. Mustapha Khalfi, Minister of Communications and Spokesperson of the government of Morocco, Faith Muthambi, Minister of Communications of South Africa, Sheriff Bojang, Minister of Information & Communication of Gambia, Hassan Falha, General Manager of the Ministry of Information of Lebanon, as well as official representatives of the Foreign Ministries of Djibouti, Kazakhstan, Hungary, Spain, the Czech Republic and the Slovak Republic, attended #WCFDavos 2015. Online media coverage included 6 press releases disseminated by official partner-associations and media partners of the summit. PR Noticias from Spain delegated two journalists, who covered the event via interviews and video-records. Representatives of Facemark from Azerbaijan, the National Union of the Moroccan Press, and the Editor of "Dainik Sandhya Prakash" form India also attended the summit. Numerous tweets, re-tweets and photo-shadings registered a huge interest on the part of the global professional community, multiplying the impact of the event and reflecting the growing importance of today's communications industry as a driver of progressive changes for the future of humanity as a whole. Social media coverage in real time was handled on the hashtag #WCFDavos and the Fb event, while general coverage, reports and latest news about future events and projects are still being shared on the official Facebook page. Scott E. Fahlman, Father of the first smiley emoticon in 1982, computer science expert at Carnegie Mellon University (USA), widely recognized as an authority on artificial intelligence and knowledge representation. See you again next year, on 8-9 March!